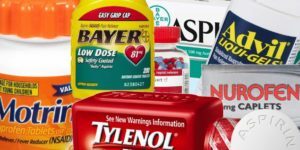 Is acetaminophen (Tylenol®) or NSAIDS (ibuprofen or asprin) safe for individuals with liver disease? Contrary to many peoples beliefs, acetaminophen can be used in patients with chronic liver disease (CLD). Most experts suggest up to 2 grams of acetaminophen a day in non-consecutive days can be safely used. Acetaminophen is metabolized to the hepatotoxic reactive metabolite, N-acetyl-p-benzoquinone imine (NAPQI), rapidly conjugated by glutathione and renally excreted. Chronic acetaminophen use, malnutrition or active consumption of alcohol can deplete glutathione resulting in harmful NAPQI-protein adducts that can lead to mitochondrial liver damage. Nonsteroidal anti-inflammatory drugs (NSAIDs) are not safe in those with cirrhosis. NSAIDs can impair renal function in these patients. Most NSAIDs are highly bound to serum albumin, increasing drug bioavailability and potential for toxicity in this population. In addition, NSAIDS are associated with an increased risk of GI mucosal bleeding, variceal hemorrhage, and development of diuretic-resistant ascites in patients with cirrhosis who have portal hypertension. Certain NSAIDs such as diclofenac and naproxen have been associated with hepatotoxicity. Therefore, low-dose acetaminophen (2 grams or less/day on non-consecutive days) is preferred over NSAIDs in patients with chronic liver disease.